The Environmental Protection Agency says an unknown amount of a dangerous chemical linked to birth defects and cancer may have washed downriver from a Houston-area Superfund site during the flooding from Hurricane Harvey. EPA said Thursday night it has ordered the companies responsible for the San Jacinto River Waste Pits site to immediately address damage to a protective cap of fabric and rock intended to keep sediments highly contaminated with dioxins from spreading. The companies, International Paper and the Waste Management subsidiary McGinnis Industrial Maintenance Corp., have made initial repairs to the underwater section of the cap where the protective rock was missing. EPA said a sample collected by an agency dive team from the exposed area showed dioxin levels at 70,000 nanograms per kilogram -- more than 2,300 times the level set to trigger a cleanup. Dioxins do not dissolve easily in water but can be carried away with any contaminated sediments and deposited over a wider area. Residents in nearby neighborhoods that flooded during the storm are now worried contaminated mud might have been washed into their homes, said Jackie Young, a local environmental advocate. 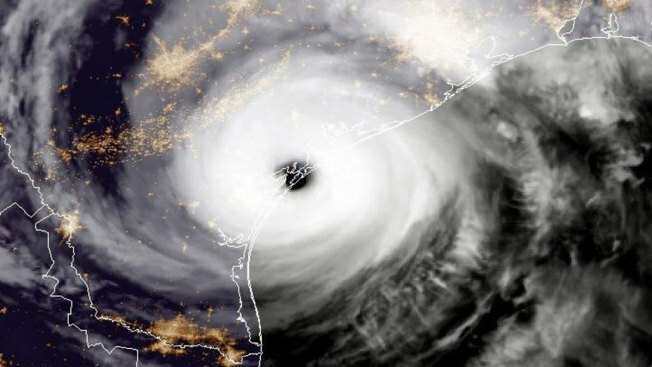 "For years we've told the EPA it's not a matter of if this area is struck by a hurricane but when," said Young, executive director of Texas Health and Environment Alliance. "The scary part about this is we have no way of knowing where all the contaminated material was carried by Harvey's floodwaters." At least one dozen Superfund sites in and around Houston were flooded last month in the days after Harvey's record-shattering rains stopped. Associated Press journalists surveyed seven of the flooded sites by boat, vehicle and on foot, including San Jacinto. The EPA said at the time that its personnel had been unable to reach the sites, though they surveyed the locations using aerial photos. The San Jacinto River Waste Pits Superfund site is on and around a low-lying island that was home to a paper mill in the 1960s. The site was completely covered with roiling floodwaters when the AP surveyed it on Sept. 1. About 16 acres of the site were covered in 2011 with an "armored cap" of fabric and rock intended to contain the contamination until it can be removed as part of a proposed $97 million cleanup plan. The cap was designed to last for up to 100 years, but it has required extensive repairs on at least six occasions in recent years, with sections becoming displaced or going missing. In its statement, EPA did not disclose precisely when the damage to the cap from Harvey was first discovered. AP observed a dive team working from a boat over an underwater section of the site on Sept. 13. Workers began using heavy machinery to add layers of rock to the cap the week after the storm. EPA said additional testing will now be needed to determine whether the contamination spread and to ensure that the exposed waste material is isolated. Despite EPA's statement affirming that contaminated materials were exposed by the storm, International Paper and McGinnis said in a statement that "no evidence exists that there was any release of waste material to the environment as a result of Hurricane Harvey." "The assessments also demonstrate that the existing armored cap performed well," the companies said. San Jacinto is at least the second Houston-area Superfund site where contaminated materials may have been spread by Harvey's flooding. AP reported Sept. 18 that three separate spills were reported from flooded tanks at U.S. Oil Recovery, a former petroleum waste processing plant contaminated with a dangerous brew of cancer-causing chemicals. EPA Administrator Scott Pruitt has called cleaning up Superfund sites a top priority, even as President Donald Trump's proposed 2018 budget seeks to cut money for the program by 30 percent. Following AP's reporting on flooding at Texas Superfund sites, Pruitt flew to Houston and visited the San Jacinto site. The AP was not notified about Pruitt's visit and was not able to attend or observe, but Pruitt spoke afterward to a local Fox affiliate. "When you have a temporary situation like this, when you take rock and put in on top of a site to secure it, you have a big enough storm, something like this, that could cause a disruption of that rock and a release could occur," Pruitt said. Elena Craft, a health scientist with the Environmental Defense Fund in Austin, said EPA has been "woefully inadequate" in assessing environmental health risks as a result of Harvey. She called the prospect of a breach at San Jacinto a worst-case scenario. "Dioxin is one of the most toxic substances known to man," Craft said. "They were slow to collect any samples, they made inappropriate statements on health risks before having any scientific evidence, and have not provided enough information on risks for anyone within the local communities to make informed health decisions."